Founded in 1989, Renaissance Cruises was a once flourishing line that had an impressive fleet of eight nearly identical ships by 2001. The operation had also been struggling financially by that year, with the events of September 11 and resulting travel slump being the final straw that broke the camel’s back. Nonetheless, each former R-class ship remains in operation to this day under a variety of different brands. A brief interlude from 2012 to 2014 had the ship on lease to Hapag-Lloyd Cruises as Columbus 2 before returning to Oceania as Insignia. Actually, R Two was the first Insignia for Oceania from 2002 to 2003 before being renamed Regatta when R One took over the moniker. Otherwise, it’s one of the least-storied of the 30,277-ton, 684 to 826-guest ships, at least in name. R Three has an even simpler history as it has only ever been Pacific Princess following its Renaissance run since 2002. It now remains the only R-class ship in the Princess Cruises fleet and was recently remodeled with the line’s bold new livery. Now, the signature “Sea With” logo covers a large portion of the bow in addition to the smokestack. Princess Cruises also had possession of R Four for quite awhile as Tahitian Princess from 2002 to 2009, later renaming to Ocean Princess from 2009 to 2016. Though, by 2016 it too went to Oceania as Sirena where it became the fourth R-class ship in the fleet with some features added from its Marina and Riviera new-builds. R Five is the last to technically have only two titles, becoming Oceania’s Nautica in 2005. It did operate under Pullmantur Cruises as Blue Dream from 2002 to 2004, but it never officially changed its registered Renaissance name. R Six, on the other hand, did become Blue Star (2003-2005) and Blue Dream (2005-2007) for Pullmantur before co-parent company Royal Caribbean Cruises Limited conceived of Azamara Club Cruises. Originally considered an offshoot of corporate cousin Celebrity Cruises with ship names Celebrity Journey and Celebrity Quest, Azamara eventually became its own line. Thus, the current Azamara Journey was born in 2007. R Seven followed a similar Pullmantur to Azamara path but only after it was Delphin Renaissance (an appropriate callback) from 2003 to 2006 for Delphin Seereisen. Then under Pullmantur, it became Blue Moon briefly (2006-2007) before heading over to Azamara as Azamara Quest, where it continues today. Last but not least is R Eight which transformed into Minerva II from 2003 to 2007 for Swan Hellenic before becoming a third R-class ship for Princess Cruises: the Royal Princess (2007-2011). Of course, the Royal Princess name was later repurposed for a new-build and new Royal-class when this ship was transferred to P&O Cruises and became the Adonia in 2011. 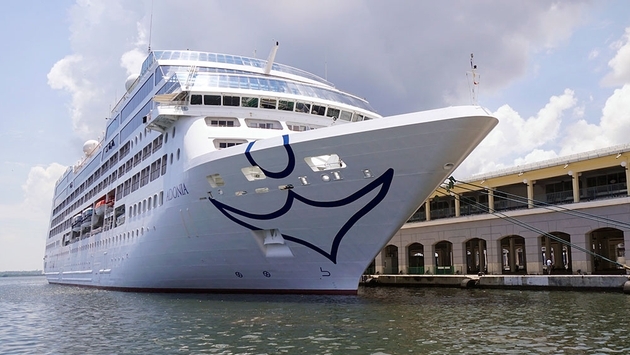 For all intents and purposes, it has operated entirely under P&O since that time, but the Adonia did receive all-new livery under Carnival Corporation’s Fathom brand from 2016 to 2017. However, that short-lived overlay has since been dropped with the ship returning fully to P&O branding as of June 2017.